I remember my dad's business partner, Jack, fixing all the transistor radios on his bench...the biggest problem was the broken printed circuit boards - they'd crack when dropped and he'd hafta not only glue the board together but reconnect all the lines...fixing them was a money losing proposition. The local hardware store sold their 9V Duracells loose out of a basket. There was no packaging, only a red plastic strip covering the battery's contacts. I would buy them for my small transister radio in the 1970's. Earlier in the 1950's when portable radios became popular they were big and used only D's -- maybe 4-8 of them depending on radio model. You'd carry the radio on a shoulder next to your ear as you walked. 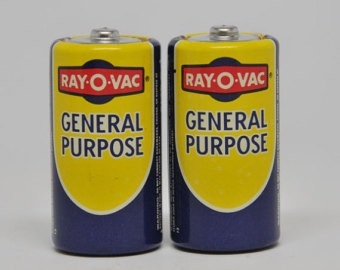 My dad had a TV repair store in Fort Lee, NJ and sold those Eveready batteries (silver with the black cat & lightning streak - also the Red & Black RCA batteries) wish I'd had the forethought to save one or two of both...at that time (50s & 60s) we sold more 'D', 'C' & 9 volt batteries tha AA or AAA...even sold those almost foot long 12 V batteries for the early (40sa style) portable radios...mostly older ladies would lug 'em into the store lookin' for 'battrees'. Just about every electronic kids toy of the day used 'D' type batteries...."Batteries not included!!!" Thanks, Tommie. I'd forgotten about Burgess batteries. They, along with Eveready "Nine Lives" batteries, have been added now.